In 2013 retail sales in the United States rose to $4.53 trillion, an increase of 16 percent from the prior year. According to the U.S. Department of Commerce, retail sales made up 27 percent of the nation’s gross domestic product in 2013, up from 26.8 percent in 2012. That kind of activity as the economic recovery continues would presumably lead to an increase in retail jobs, but unemployment among Idaho retail workers is much higher than the 5.2 percent jobless rate for the overall economy in March. According to second quarter 2014 estimates by Economic Modeling Specialists International, several industry sectors are enjoying unemployment rates well below the economy wide rate. Unemployment for utilities is at 1 percent, transportation and warehousing at 2 percent, wholesale trade at 2 percent, mining at 1 percent, information at 1 percent, finance and insurance at 2 percent, real estate at 1 percent and professional, scientific and technical services is at 3 percent. Construction with 17 percent unemployment and manufacturing with a 10 percent unemployment rate were among the industry sectors hardest hit during the past recession. Unemployment for retail during the second quarter of 2014 was at 11 percent, with high retail unemployment in all six regions of the state. Employment in the retail sector fell from 83,300 in 2007 to 77,500 in 2013. 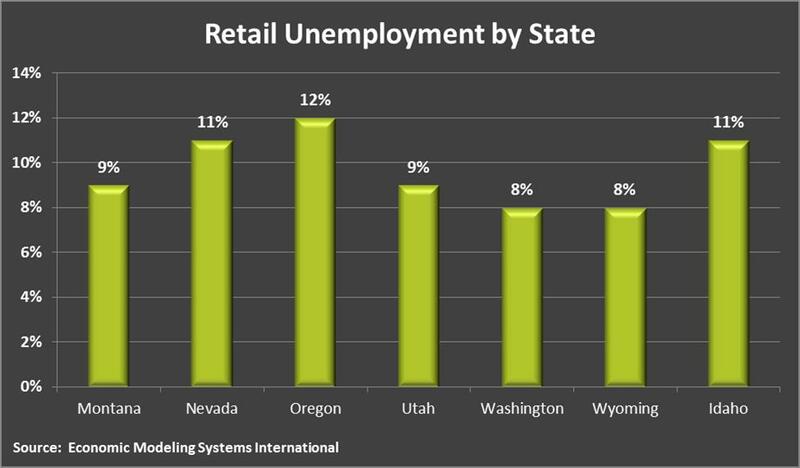 Idaho is not alone in high unemployment in the retail industry. 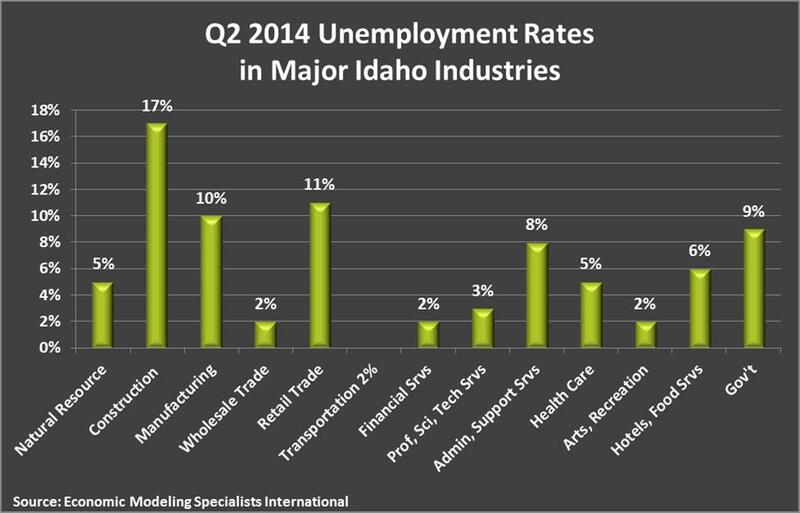 Nationally, unemployment rate for retail trade is 10 percent, only one point lower than the Idaho rate. Neighboring states likewise struggle to provide employment opportunities for workers with experience in retail sales. 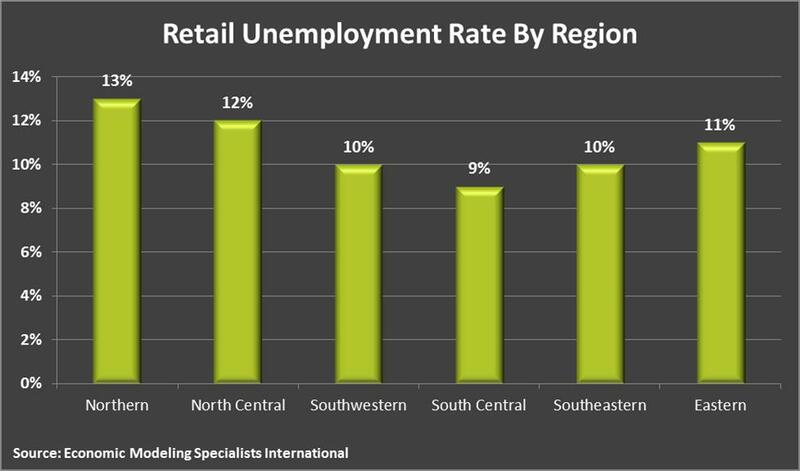 High national and regional unemployment rates for retail indicate the cause is not isolated to Idaho. Internet sellers such as Amazon.com, eBay and overstock.com may be having an effect. Many chains such as Wal-Mart, Target, JC Penny, Best Buy and Sears are also increasing the amount of retail business they conduct via their websites, and all of these Internet transactions reduce the need for retail staff at brick and mortar locations. Online retail trends are expected to increase, while retail employment opportunities will continue to decline, forcing people who traditionally work in retail to seek training or education for other occupations in the evolving global economy. Find more information on the programs and services available to help displaced job seekers. This entry was posted in Employment News and tagged idaho department of labor, idaho economy, idaho jobs, retail on May 21, 2014 by Idaho Department of Labor.